U.S. Department of Interior’s Bureau of Land Management announced FY2018 revenue from oil and gas sales and the results are staggering: its state offices shattered prior records, generating $1.1 billion from oil and gas leasing, without expanding acreage. The previous record was set in 2008, when BLM leased more than 2.6 million acres for oil and gas production and grossed approximately $408 million in revenue. Last year BLM leased fewer than 1.5 million acres. 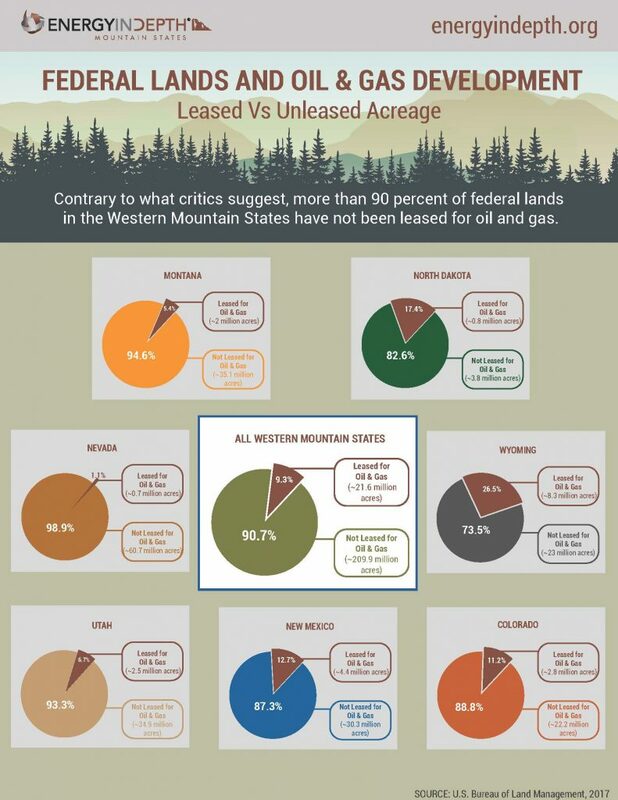 Despite activist attempts to paint BLM leasing under the Trump administration as a wild west free-for-all, the number of new acres leased has fallen off since 2012. In other words, BLM’s revenue is skyrocketing without the government parceling off “all” our federal acreage. In fact, BLM tripled its revenue from 2008, while decreasing the number of acres leased by more than 40 percent. In addition, the United States continues to decrease the total acreage leased for oil and gas development. From 2008-2017, aggregate leased land decreased by more than 45 percent from 47,242,495 to 25,742,991 acres. EID research shows less than 10 percent of lands in the Mountain States region are actually leased for oil and gas development. BLM’s New Mexico office contributed the most to last year’s record, generating approximately $972 million in revenue during one lease sale alone, more than doubling BLM’s total revenue from oil and gas lease sales in 2017. The September sale also broke the record for the highest-priced single parcel of land. These staggering results reflect industry’s optimism for the immense potential in the Permian Basin. In December, the U.S. Geological Survey revealed the “largest continuous oil and gas resource ever assessed” lies in the Permian Basin, with an estimated potential for extracting more than 46 billion barrels of oil, 281 trillion cubic feet of natural gas and 20 billion barrels of natural gas liquids. The leases have broad implications for state economies. BLM estimates $500 million of the revenue will go directly back to states, helping to fund key community benefits like hospitals and public schools. In New Mexico, the oil and gas industry provides more than 90 percent of school capital investment. BLM’s estimates don’t even account for the tax royalties from oil and natural gas produced on the lease, which fill state coffers and fund necessary institutions and infrastructure. BLM’s record shattering year is indicative of a thriving oil and gas industry contributing to our economy, energy security, and American jobs. In 2017, a year that generated a fraction of 2018’s revenue, oil and gas development supported 84,000 jobs and contributed $59.6 billion to the U.S. economy.